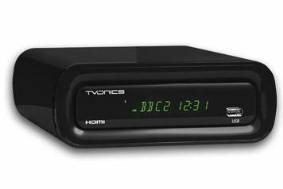 TVonics launches DTR-HV250 Freeview+ box with HDMI switching | What Hi-Fi? TVonics has a new box on the shelves, the DTR-HV250, and it's the company's first to include an HDMI output, which it interestingly partners with two HDMI inputs. This 'HDMI Switch', as TVonics calls it, allows you to connect other sources to the box and run just the one HDMI cable to your TV. Elsewhere you'll find the necessary two digital tuners for all the Freeview+ functionality, such as recording two channels at once and pause and rewind TV. A 250GB HDD promises around 125 hours of recording time, while you'll find an 8-day EPG to help you start filling it up. The DTR-HV250 is available to buy on the TVonics website for £230.